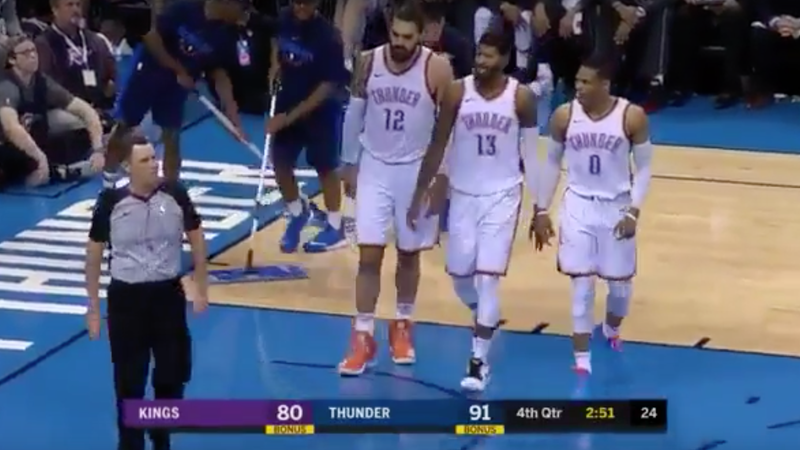 Carmelo Anthony After Russell Westbrook's Ejection: "I'm Done With The Refs"
Russell Westbrook got ejected from Monday’s Kings-Thunder game with just one very sudden traveling call. With under three minutes to go in the game, Westbrook drove and thought he got fouled. He went down holding his face, but only drew the traveling violation from referee Matt Boland. When Westbrook tried to plead his case, he got two straight technicals with almost no time between them. Just last week, Anthony criticized NBA refs for having too quick a trigger on technical fouls and limiting dialogue with the players. His comments fit a trend, as a greater number of players are lamenting the disconnect between players and officials. Most notably, Draymond Green suggested replacing all of the league’s current referees to ditch the bad blood. A meeting between players and officials is scheduled for the All-Star Weekend to try and cool some of the tensions. Chris Paul On Ref Who Gave Him A Tech: "That&apos;s Who They Pay To See"